This week marks the official onset of The Holiday Season. We're curating recipes, shopping for gifts and getting ready to for party upon party over the next 5 weeks. Most importantly, we need to get ready for the season of entertaining friends and family! From preparing the house to preparing food, there are many little things that often slip our mind to make it a perfect party. CVS is a one-stop holiday shop that will make your holiday entertaining fun AND fancy! And you're in luck. I have some creative ideas for you on how to give your holiday entertaining a little boost! One of the items I absolutely love from CVS is their Gold Emblem Truffles. I could eat them all day long. Unwrap 5-10 of your favorite Gold Emblem truffles and roughly chop them on a cutting board. Add them to cookie and brownie mixes for an extra sweet treat! Serving eggnog at your next party? Grate 1 truffle over a glass of eggnog before serving for a tasty garnish. 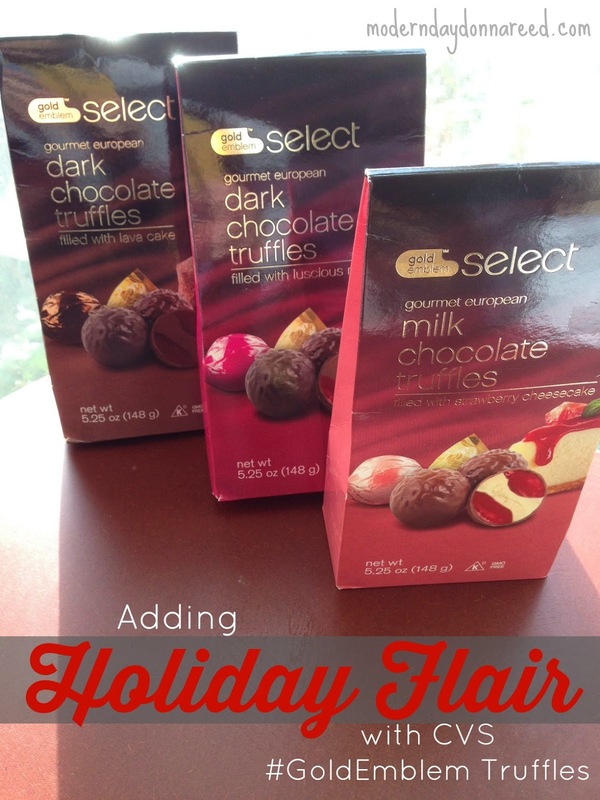 Gold Emblem truffles would also be amazing grated over hot chocolate topped with whipped cream! Sometimes you just need to keep it sweet...and simple! During the holiday season, place small glass bowls of your favorite Gold Emblem truffle flavors around your house. Be sure to pick key rooms where guests are most likely to visit: the living room, the family room, the dining room and the kitchen. Your guests will love having a sweet fix whenever they want it! CVS has many more holiday-party worthy products. Peruse the other Gold Emblem items and stock up for your next holiday gathering!